There are unconfirmed reports this evening that a Russian parliamentary delegation has secured the release of three Russian merchant marine officers arrested last year accused of fuel smuggling. 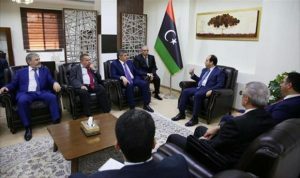 The deputies had been in Tripoli to see Presidency Council deputy chairman Ahmed Maetig. If correct, the release of the captain and the first and second officers (one of them female) of the tanker the Mekhanik Chebotarev may be seen as a triumph for the head of the Russian delegation led by Adam Delimkhanov, a cousin of Chechen ruler Ramzan Kadyrov. Delimkhanov has led previous parties of his country’s politicians to Tripoli, the most recent in October after the tanker was arrested. 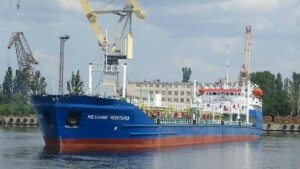 Seven crew members were released shortly before Delimkhanov arrived last October 2013, after which the envoys pulled out. As recently as last month, deputy foreign minister Mikhail Bogdanov said there were no plans to reopen the mission in Tripoli. Delimkhanov is a member of president Putin’s United Russia party which dominates the Duma (parliament). As on his previous visits, his presence could be seen as quasi-official though the Russian ambassador to Libya, Ivan Molotkov was also present today. The Kremlin backs the Libyan Political Agreement to the letter, which includes acceptance of the PC but a refusal to recognise the Government of National Accord until it has been approved by the House of Representatives in Tobruk. The Mekhanik Chebotarev was arrested off Zuwara where it was alleged by Sadiq Al-Sour, head of the Public Prosecutor’s office, that it was being loaded by smaller vessels with petroleum product. There is one report that the three seamen were due to leave with the Russian deputies and another that they had been released, had been given back their passports and would fly out of the country within two days after a court appearance. It was not possible to contact the Russian embassy this evening.